In 2010, Seattle University’s Project on Family Homelessness invited a group of news organizations and independent journalists to participate in the Journalism Fellowships on Family Homelessness. Their mission was to explore in depth the issue of family homelessness in Washington state. One of the Fellows was multimedia photojournalist Dan Lamont, who has worked for many publications, including Time, Newsweek and the New York Times. Using audio interviews and still photography, Lamont told the stories of often-overlooked homeless families in suburban and rural areas. Click here to listen to a story by Dominic Black of Seattle’s National Public Radio affiliate, KUOW, featuring several of the families also documented in these photos. While on duty in Kuwait during the Iraq War, U.S. Marine Corey McKay, 21, received an emergency phone call from Child Protective Services back in his home town of Bellevue, Washington. His wife, long dissatisfied in their marriage, had had a breakdown. After neglecting their infant daughter Kaylee for weeks, she had thrown the baby’s clothes out the window and flushed her formula down the toilet. McKay rushed home, and with no one else to care for his 3-month-old daughter, he was given a hardship discharge from the Marines. But with no job, no savings, plus the burden of caring for his mother who was suffering from a brain tumor, McKay soon ran out of resources and became homeless. By methodically leveraging the available help, McKay went from a family shelter to transitional housing and now is in permanent subsidized housing. He is caring for his daughter, attending college as a business major and has a stable relationship with a woman he met in the homeless shelter. Dan Lamont, Devotion to Duty, 2010, Giclee print. Corey displays the medals he earned as a U.S. Marine in the Iraq War. Dan Lamont, Finally Home, 2010, Giclee print. 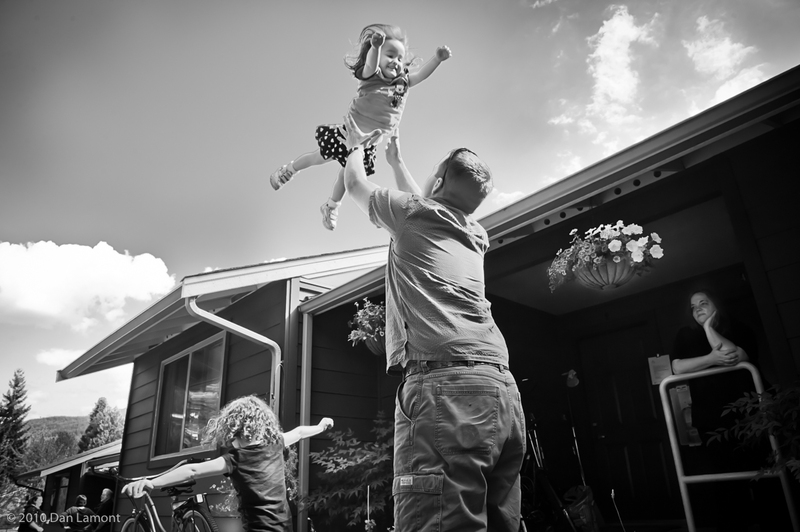 Corey, a U.S. veteran, plays with Kaylee in front of his mother’s subsidized apartment in Issaquah. Corey’s mother has experienced homelessness, lately compounded by her inability to work because of a brain tumor. She cares for Kaylee while Corey is in school. Dan Lamont, Untitled, 2010, Giclee print. 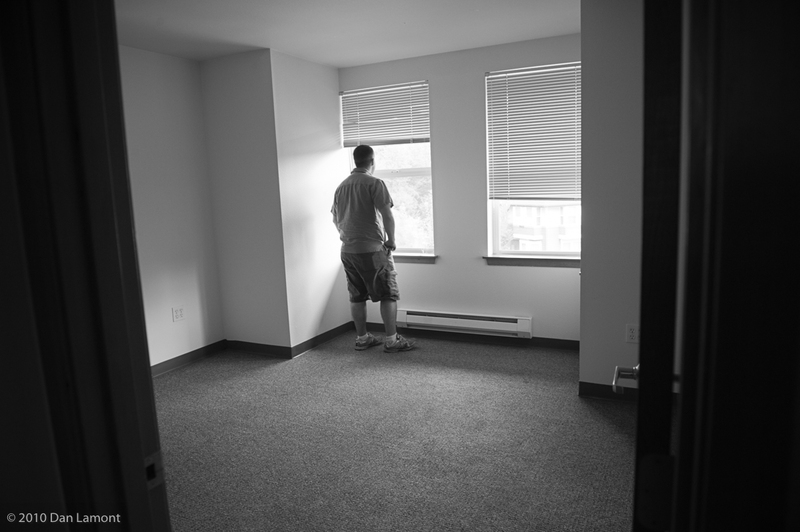 Corey gazes out the window of the temporary housing apartment he and baby Kaylee shared in Redmond. Dan Lamont, Untitled, 2010, Giclee print. 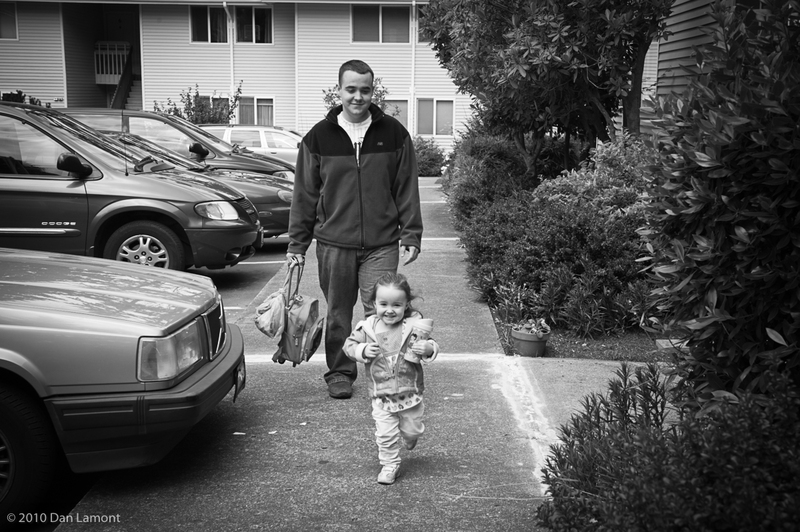 Kaylee runs excitedly in front of her father as they approach their subsidized apartment in Bellevue. Dan Lamont, Untitled, 2010, Giclee print. A social worker displays just some of the forms and paperwork related to Corey’s case. Dan Lamont, Untitled, 2010, Giclee print. Corey is greeted with a kiss when he arrives to pick up Kaylee at his mother’s house in Issaquah. Jesse Morgan, 20, became pregnant with her first child, Tyrece, now 6, when she was a 14-year-old middle-schooler. Her second child, Austin, now 3-1/2, was born when she was 17. Morgan, who was living in Concrete, Washington, divorced her violent husband (not the father of her sons) and returned to her home town of Okanogan, Washington, where she and her sons live in shelter housing. Morgan has completed a GED, is studying criminal justice at the community college and competes in rodeo events. Dan Lamont, Cowgirls Don’t Cry, 2010, Giclee print. Jesse, 20, here preparing lunch for her three-year-old son Austin, is an accomplished rodeo rider. Dan Lamont, Untitled, 2010, Giclee print. Jesse, 20, and her sons Tyrece, 6 and Austin, 3, in front of the shelter housing they share in Okanogan, Washington. Dan Lamont, Untitled, 2010, Giclee print. In front of a group of cottages in Okanogan used as shelter housing for the homeless, Jesse calms her three-year-old son, Austin, while his brother, Tyrece, 6, looks on. Dan Lamont, Untitled, 2010, Giclee print. Austin, 3, has been on the move and homeless almost all his life. Lewis Price, 27, and his wife, Aunika, are together trying to raise her four children from previous unions. They are homeless and having a very difficult time securing housing because of a criminal record associated with Price’s name — a record he says is a case of mistaken identity. Dan Lamont, Price Family, 2010, Giclee print. Lewis, Aunika and their children pose in front of a Yakima home they were scheduled to occupy until a felony record that Lewis says belongs to another man with the same name. Dan Lamont, Untitled, Giclee print. As one of his stepchildren watches, Lewis pours donated gas into his car, which has run out for the second time in two days. The couple spends a great deal of time driving the children around Yakima to and from their schools and daycare programs. Dan Lamont, Untitled, 2010, Giclee print. With more children than seatbelts, Lewis and Aunika risk moving violations in their daily excursions they can ill afford. Dan Lamont, Untitled, 2010, Giclee print. Lewis, Aunika and their kids shop at a Yakima supermarket. Their emergency shelter housing has limited cooking facilities, so the family must make do with inexpensive, ready-made meals. After raising five children of their own, Darlene Burns (50) and her husband, Michael Burns (59), adopted three more children: Avrial, 17; her brother Justin, 6; and another brother, age 16. When the Nevada-based business they owned failed, they lost their home and moved to Colville, Washington to be near relatives. With the help of Rural Resources, an eastern Washington social service agency, the family is now getting back on their feet. The shelter house they occupy is furnished entirely from donations and scavenged items. Darlene is in school learning new skills and Michael has found part-time work as a health aide for a senior citizen. Dan Lamont, Untitled, 2010, Giclee print. Darlene and Michael with their adopted children, Justin and Avrial, at the new home they are making with the help of local non-profit agencies in Colville, Washington. Dan Lamont, Darlene, 2010, Giclee print. Darlen, who first lost her business and then her home when the recession hit. Rhea Eaton, in her 50s and mother of eight children, became homeless in Colville, Washington after she left her husband, who had tried unsuccessfully to establish a homestead off the grid (without water or electricity, etc.) in the mountains of northeastern Washington State. Dan Lamont, Untitled, 2010, Giclee print. 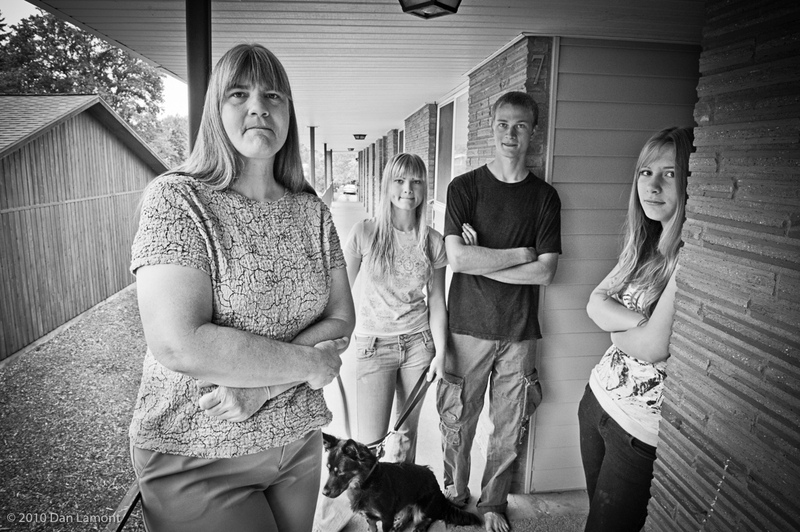 Rhea and three of her eight kids in front of her subsidized housing apartment in Colville. Dan Lamont, Untitled, 2010, Giclee print. Rhea, mother of eight and homeless, Colville, Washington. After living in an emotionally abusive situation, living in a car in a Walmart parking lot, Justine, 19 (last name withheld) and her 8-month-old daughter, Analiya, found shelter housing through Friends of Youth in Bothell, Washington. Justine is studying to be a nurse. Dan Lamont, Untitled, 2010, Giclee print. Justine, 19, and her daughter, Analiya, in the living room of their Bothell emergency housing apartment.